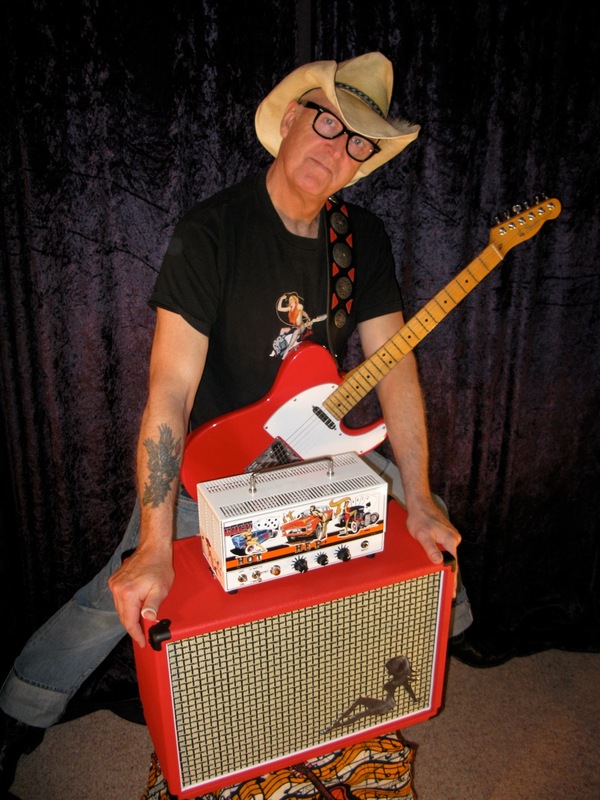 Chet Romero is pictured here proudly displaying his brand new 1×12 tone cabinet in stunning red tolex & checkerboard grille, built by the Richards Amplifier Company – Australia. 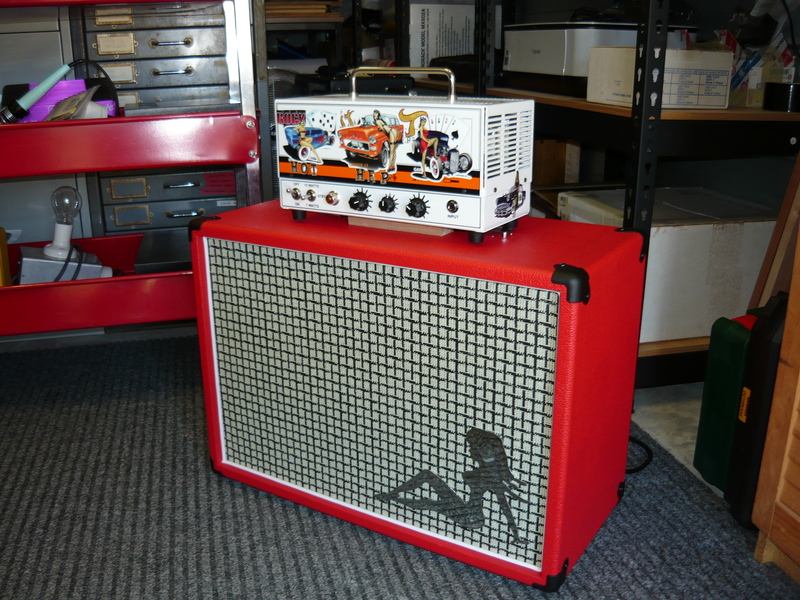 This tone cabinet is loaded with the Weber Blue Dog 30W alnico instrument speaker, specifically intended to be matched with Chet’s most recent amp acquisition – the Orange Tiny Terror 15W head. 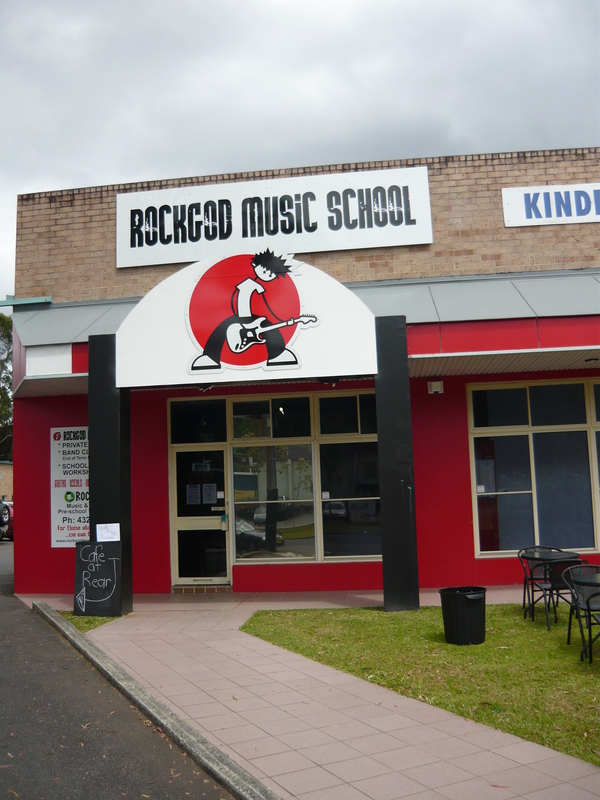 As you may have read in previous blogs, we have been servicing Orange amps for many years now, for the musicians of Central Coast NSW, and also for Bondi Intermusic of Sydney. 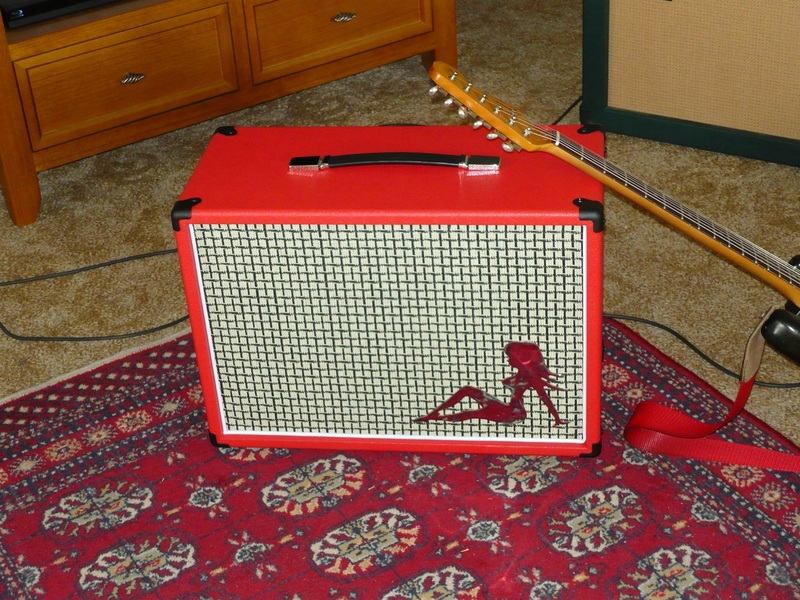 You can see that our standard Richards Amplifier Company logo is missing from this cab, instead Chet has supplied us with his own personal logo which is basically a truckers symbol of a very shapely and unclad female reclining on the bonnet of a truck. We are happy to indulge our customers requirements and personalise our cabs in this way, so bring it on ! Easy to see that Chet is a staunch St George supporter, by the way. Having played with Men at Work, the Foreday Riders, and many more, plus composed music for film, television and live theatre productions, Australia’s wildest blues guitarist is about to launch his latest band Chomp Incorporated in November 2011, so watch out for more news about that ! Chet played that delicious little slide guitar solo on Men at Work‘s last single, Everything I Need (from the Two Hearts album). This Weber-loaded tone cabinet sounded phenomenal either with the Tiny Terror or our own Richards Expressionist Series amps. In next week’s blog we get together with some members of the Sydney Shadows Club and compare the Weber against the Celestion 15W alnico Blue speaker. They both sounded great, but there were unexpected differences ! 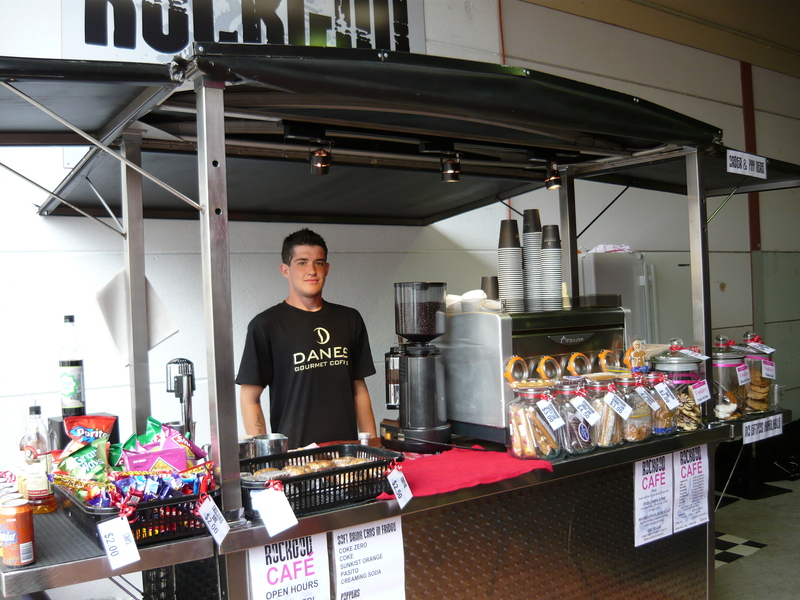 Thanks to Chet Romero for his news and his continued interest in our products and services. Regards – Ivan. 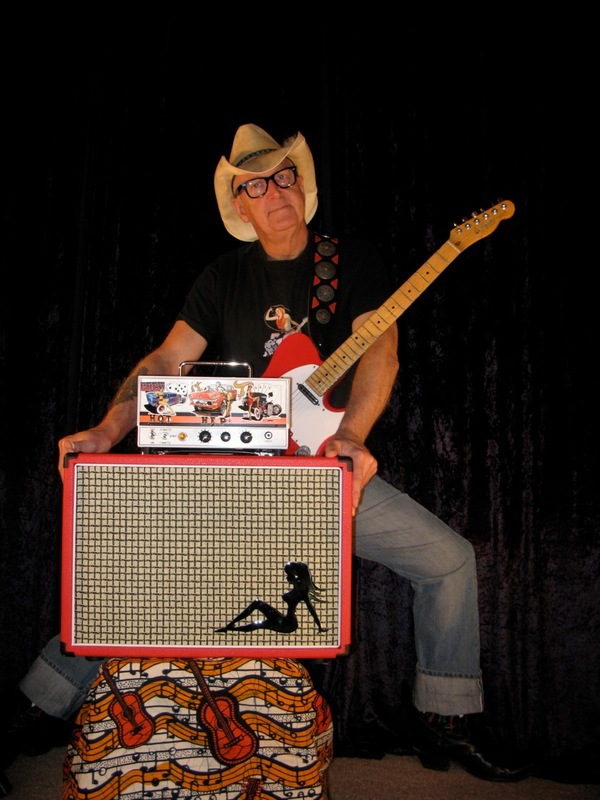 This is actually the very first amp I designed and built for Bob Spencer, a much loved and admired Aussie rock guitarist formerly of such bands as Finch, Skyhooks, The Angels, etc, and more recently RAW BRIT, as well as facilitator/coach on the Weekend Warriors programme in Melbourne. This amp was built back in 1997. 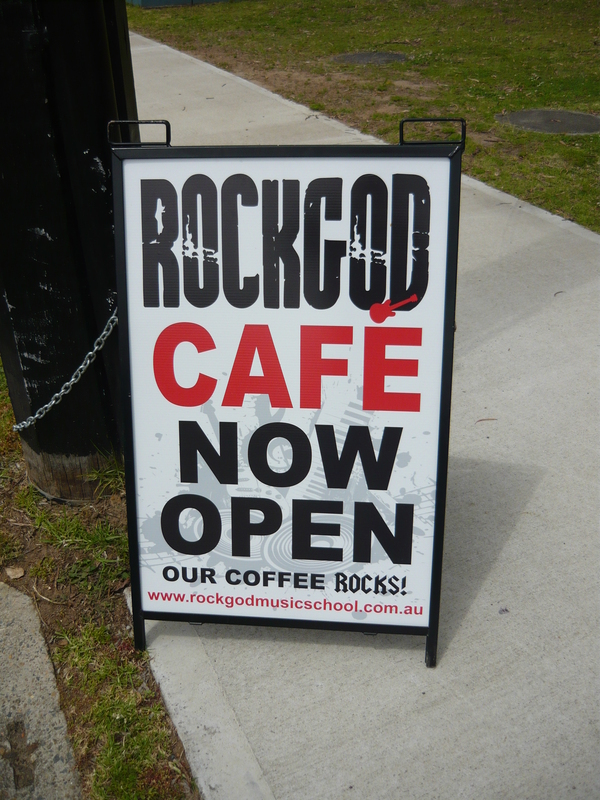 We actually met in 1995, when Bob was recording the Temple Gods album, in a studio somewhere on the Hawkesbury River. 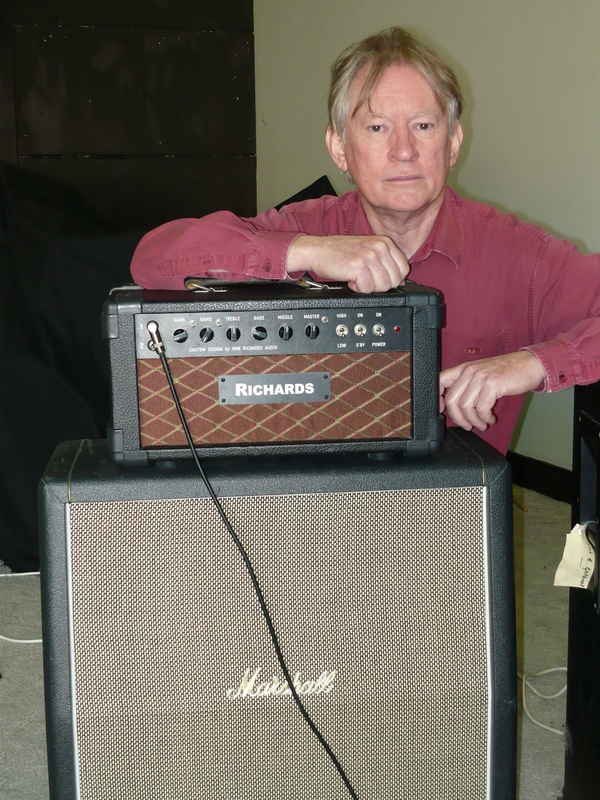 He showed up at my house in Gosford at about 11 o’clock at night, to get a modification done to his AC30 clone amp (built by Ross Nichol in Melbourne, I think ?). This is how you meet guys like Bob !! 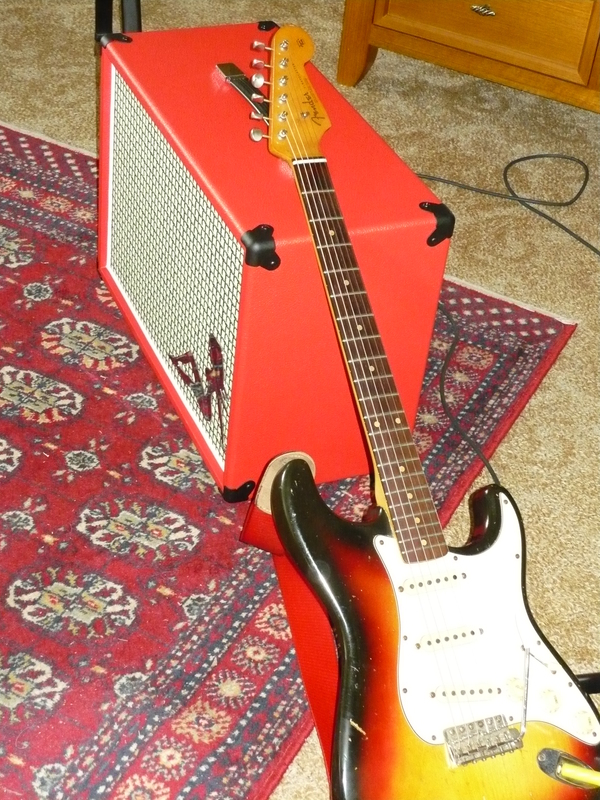 This was at the time when I was working from the kitchen/family room of our house in Wyoming (NSW) – there were amps waiting repair from one end of the house to the other, and amp parts stored in every room of the house – even under the kids’ beds, etc etc. Not the ideal way to live, and eventually I rented my current workshop space. Anyway, Bob made himself at home in the kitchen, my wife made us cups of tea, and I got on with the job. 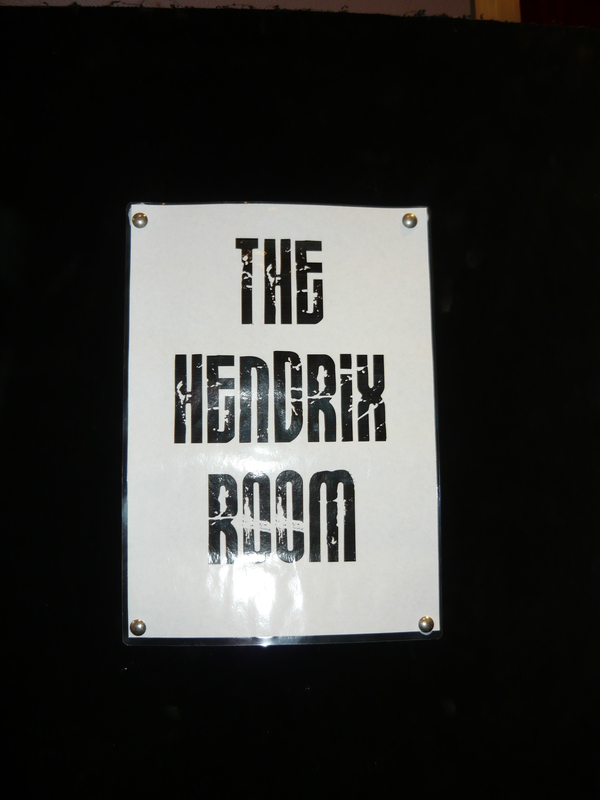 Bob obviously liked what he saw and heard, and kept making the trip up to the Central Coast whenever he needed something done to his amps and pedals. Bob was living in Katoomba (NSW) at the time, in a charming house built 100 years ago or so. 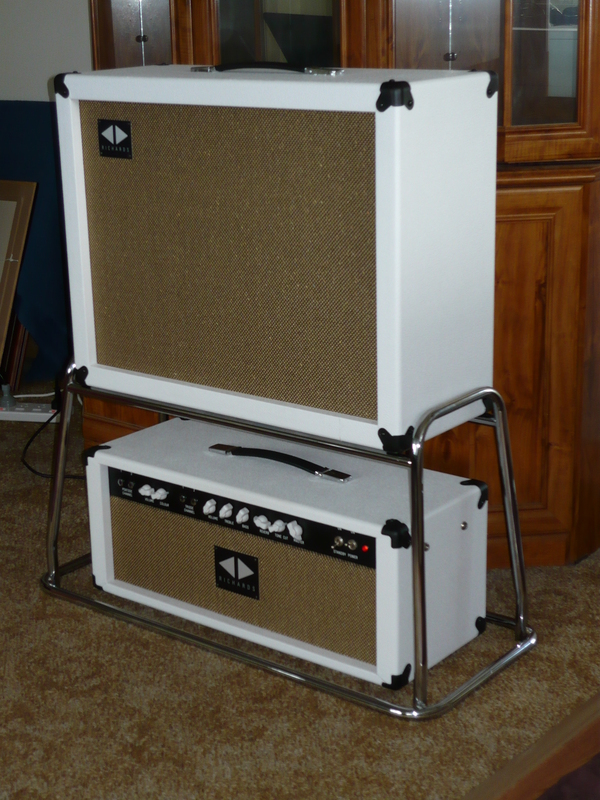 Once he discovered I built amps/pedals/power supplies, he started getting stuff custom-built. First up, he ordered two rack-mounting preamps – the first enabled him to switch between a Hiwatt voiced preamp and an Ampeg voiced preamp. The second one enabled him to switch between two AC30 voiced preamps. 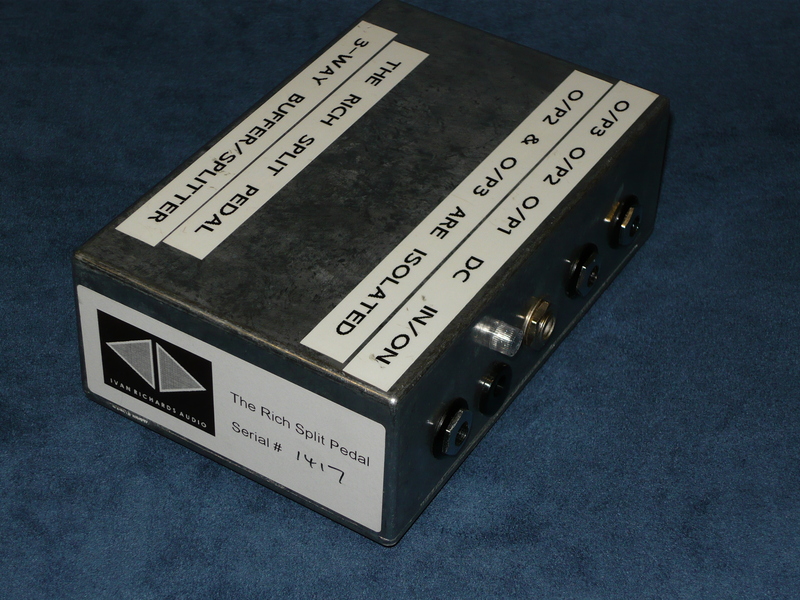 Bob was the first customer to purchase my first two successful pedal designs in 1997 – the Rich Drive and the Rich Fuzz. We kind of agreed on what we were looking for in a pedal, as well as what was missing from commercial pedals, and a lot of collaboration went into those two pedal designs, especially the Rich Fuzz. I love that kind of stuff ! Both pedals are still available today (2011), and the designs have not been altered in any way, although the cosmetics continue to change. 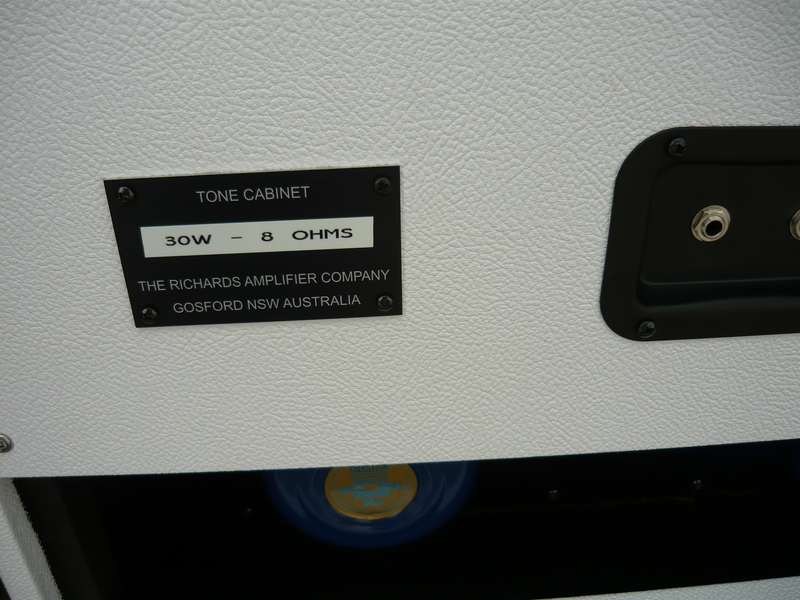 Bob was building a home-studio in the house at Katoomba, and ordered a low powered amp (6V6 output valves) to drive a 1×10 cab housed in an isolation box. 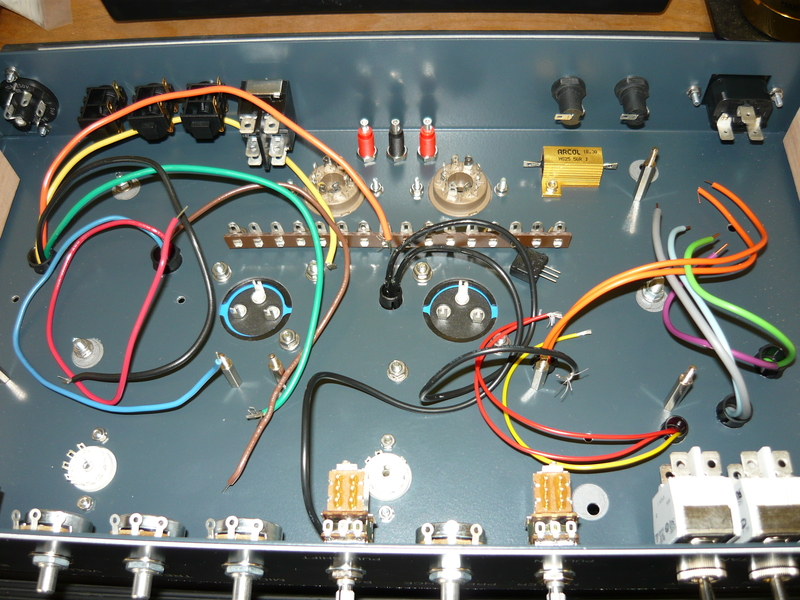 I originally built a switchable 8W/4W push-pull amp, based on the designs I was using at that time. This was well before the current craze for low powered amps. We soon realised, however, that a mere 8 watts wasn’t driving the chosen 10-inch speaker hard enough to achieve the optimal recording results when mic’d up ! There is definitely a lesson there for everyone. 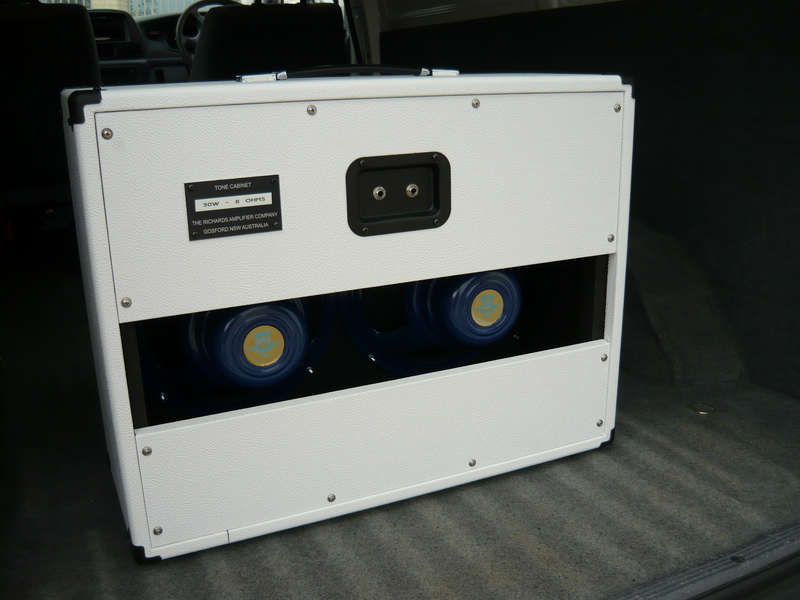 The power output was increased to 12 watts, and then 15 watts, substituting different transformers. The circuitry itself stayed the same. Why is the amp called the Lil’ Buddy amp ? It’s because at that time I was calling everybody my little buddy – regardless of how tall they were. Something to do with a 70’s TV situation comedy called Gilligan’s Island. Thankfully, I have stopped doing that. This amp was used for recording of course, but also gigs, rehearsals and teaching. 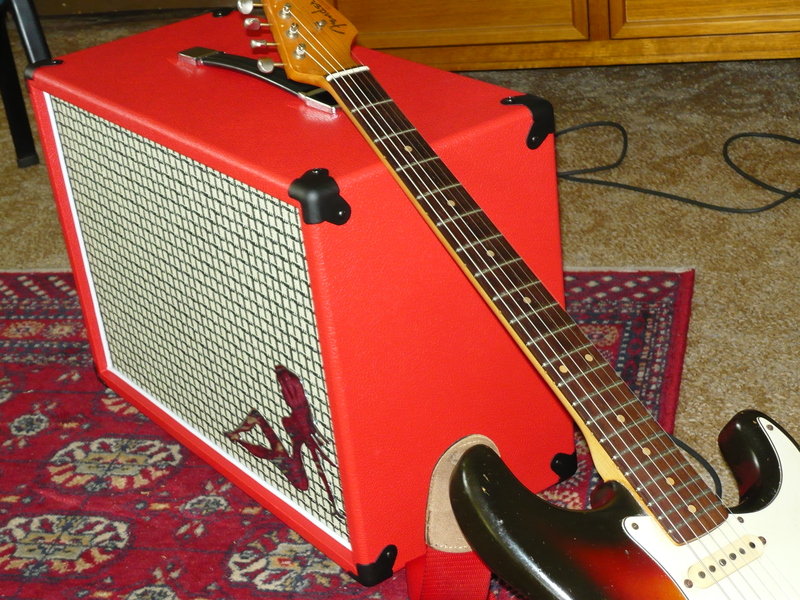 I recall seeing Bob’s blues band in a pub at Crow’s Nest (Sydney) years ago, using the Lil’ Buddy driving a Wasp 250 watt/4 x KT88 amp used as a slave, into a pair of 2×12 cabs, loaded with Etone speakers (from Peakhust/Sydney, no longer manufactured). What a sound ! Some noise complaints, though. How rude ! 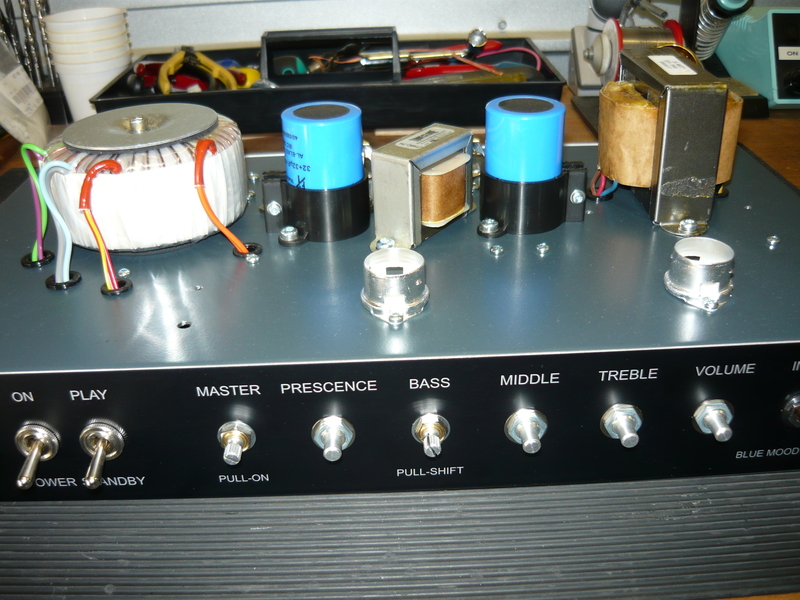 At the beginning of this millenium, Bob & missus relocated to Melbourne and also ordered firstly an 85 watt/4 x KT66 amp which is currently Bob’s stage amp, and secondly a 28 watt KT66 amp. 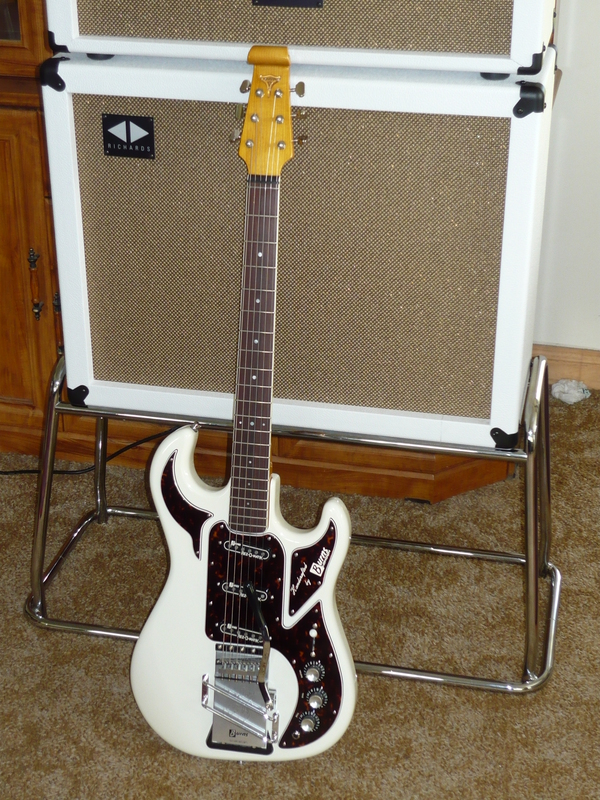 Both amps were custom designs employing baxandall EQ, and other features unique to Bob. 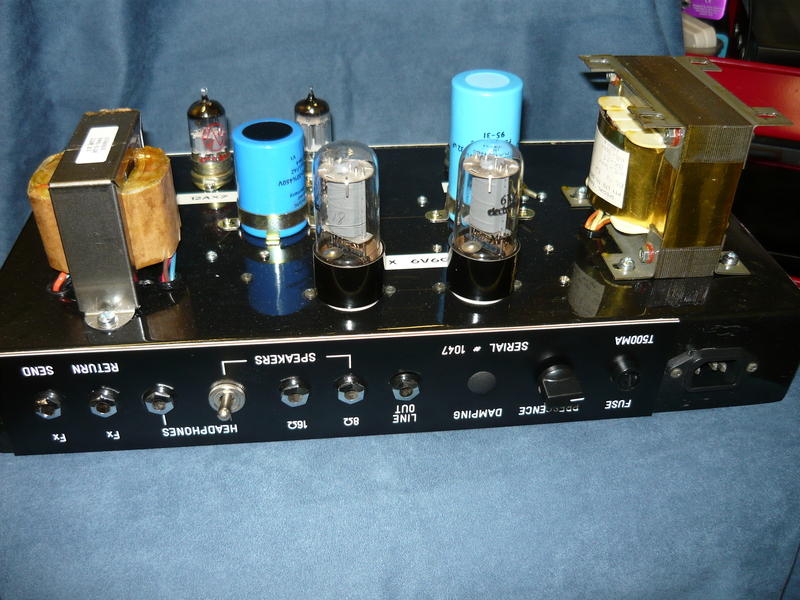 The Lil’ Buddy amp fell into disuse for many years. So where do we stand right now ? 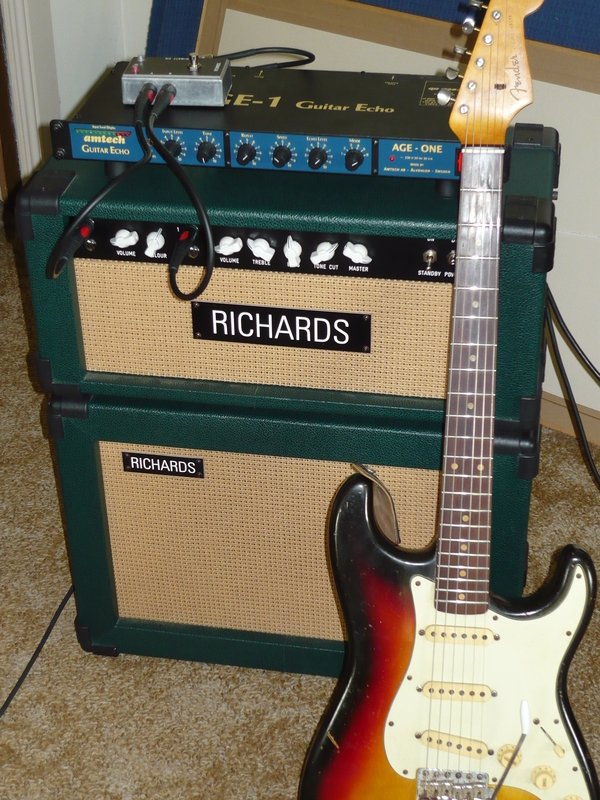 Well, Bob and Paulene are in their new residence in Melbourne, and Bob is setting up a new home studio and is preparing to do some recording, so there is a valid reason to refurbish this amp and bring it into line with the current Richards amp range. 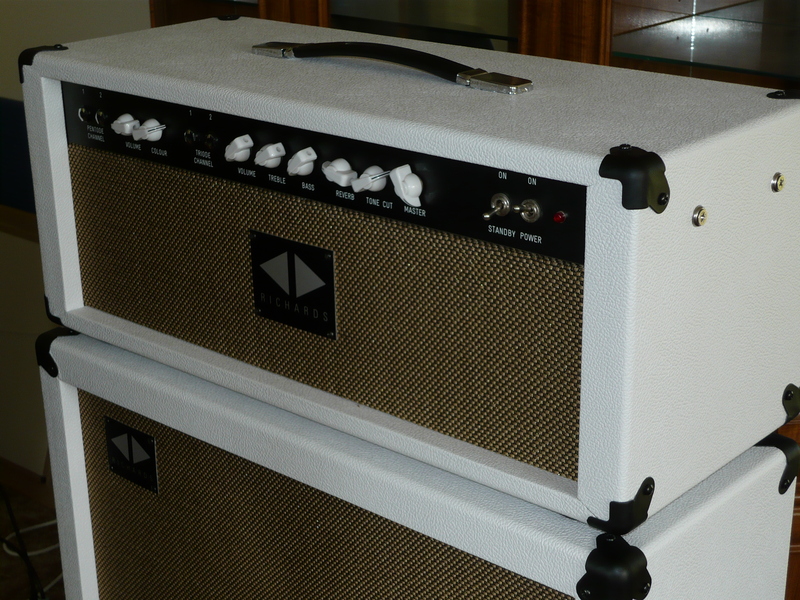 Although this is still a custom amp, it will be somewhat similar to our Blue Mood models. 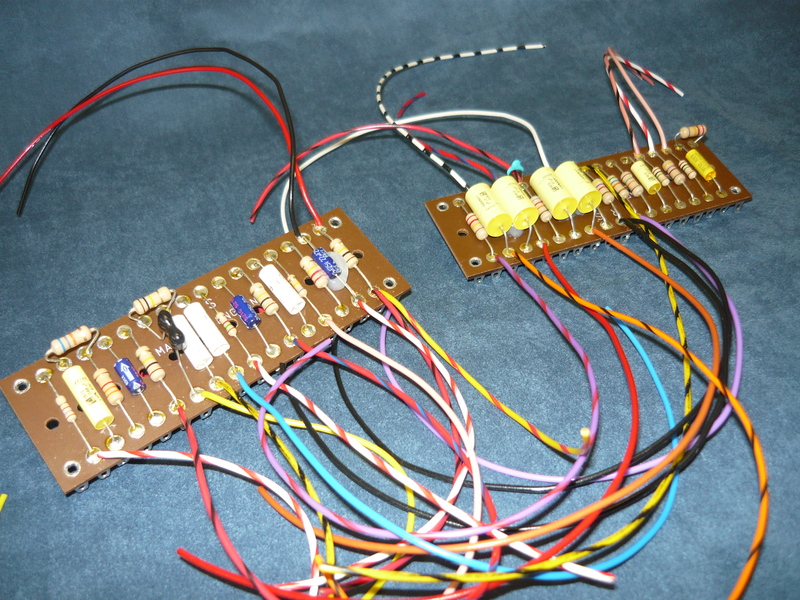 As you can see from the photos, new component panels have been pre-wired to install in the chassis. 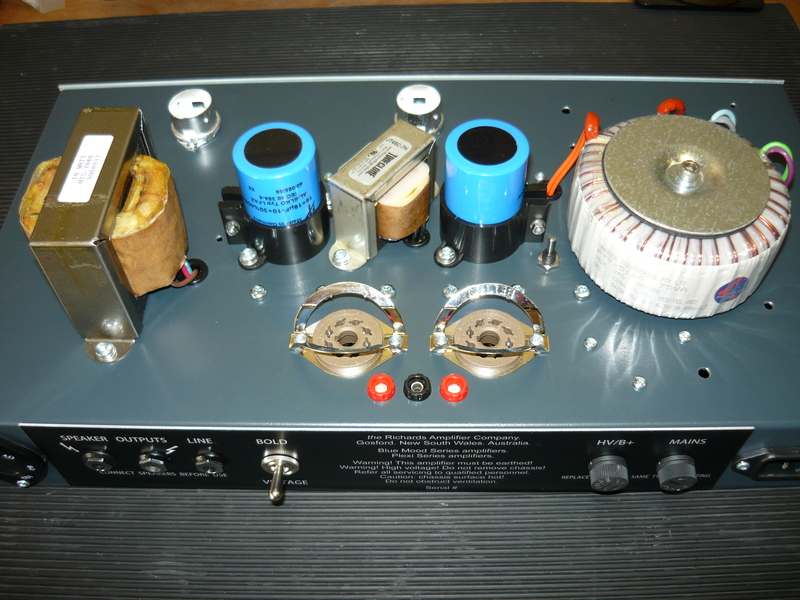 The amp also has received a new output transformer (a critical component in any valve amplifier), new pots/jacks/capacitors, and so on, plus a bit more attention to electrical safety issues, in line with today’s compliance environment. 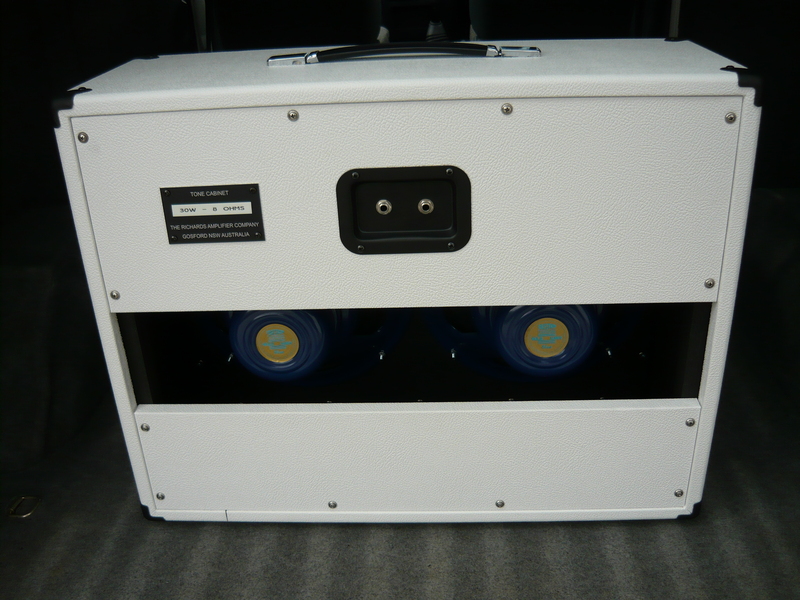 The power transformer on the chassis was the third such unit, this one giving us slightly over 15 watts rms. Some of you will have noticed a Headphones switch on the rear panel – unusual in a valve amp – this switches the ouput to a resistive load and attenuator, so the amp can be operated safely but at headphone levels. The Headphone jack can still be connected to a speaker in this mode of operation. So who is the guy playing the Craig Upfold custom Tele in the first photo ? This is Jonny Gardiner, creator of the Rock God Music School here in Wyoming, and also the singer/guitarist with successful Sydney-based band The Nevilles. 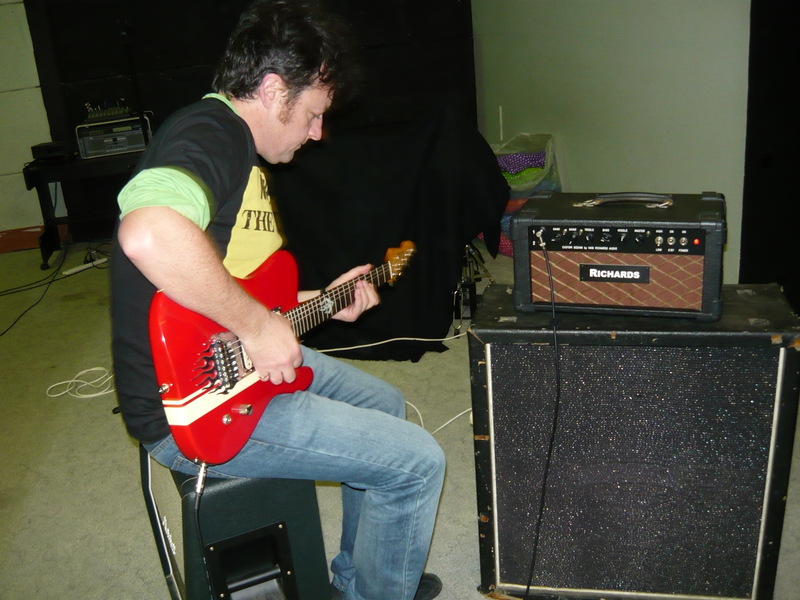 To finish off the blog, we have a photo of Bob playing with RAW BRIT in Melbourne with his Richards 85W/4 x KT66 amp head. Some great live videos of RAW BRIT in action have been uploaded to youtube.com, so you can check out these great players doing their thing. Barry Wellard, one of our local rock’n’rollers here on the New South Wales Central Coast, today took delivery of his 2nd 2×12 Tone Cabinet. 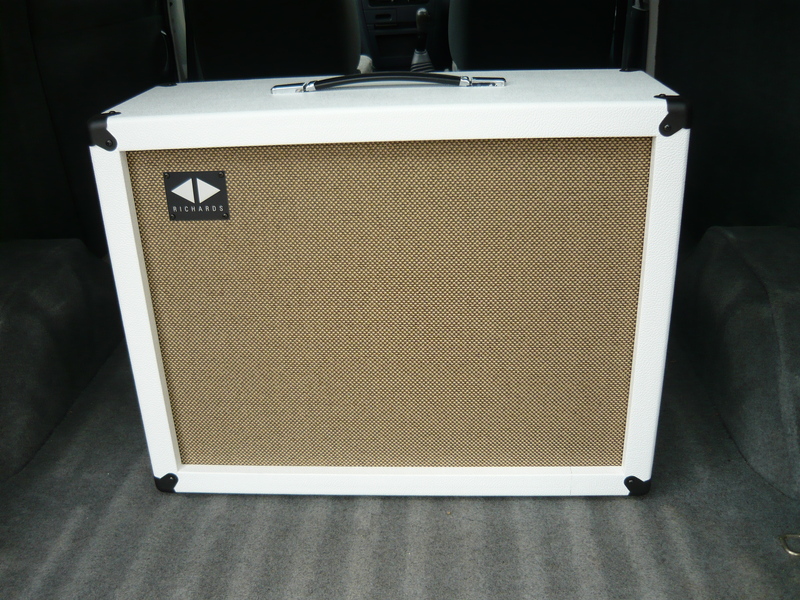 This cab features vintage white tolex covering, nicely contrasted with a black & gold speaker grille, top strap-handle at Barry’s request (we also offer heavy-duty metal side-handles from Penn), and is presented in the TV Front style. Various other options are available. 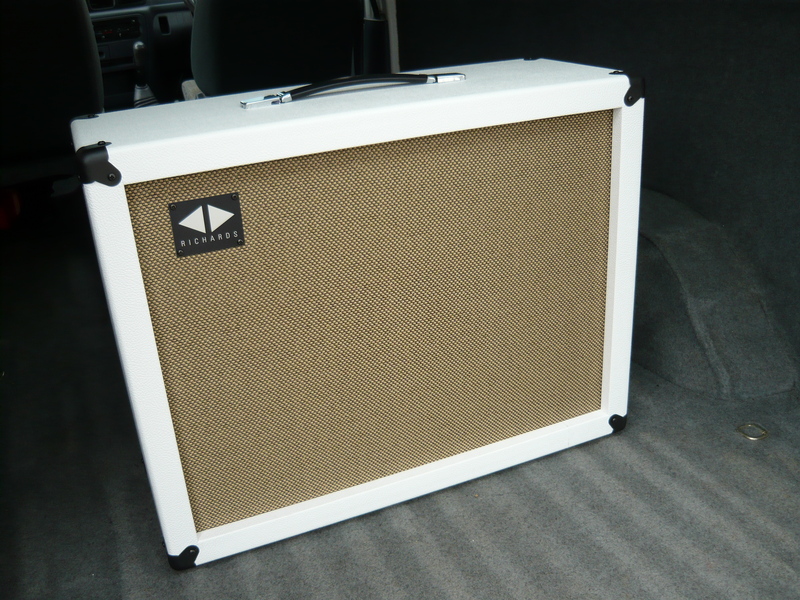 The cab is loaded with a pair of the wonderfully musical Celestion G12 “Blue” Alnico speakers, resulting in a cab power rating of 30 watts total, and a cab impedance of 8 ohms (parallel-wired 16 ohm speakers). The rear panel heavy-duty metal jack plate features a pair of parallel-wired jacks to facilitate connecting an additional cab. These speakers will enhance the tone of just about any amp ! 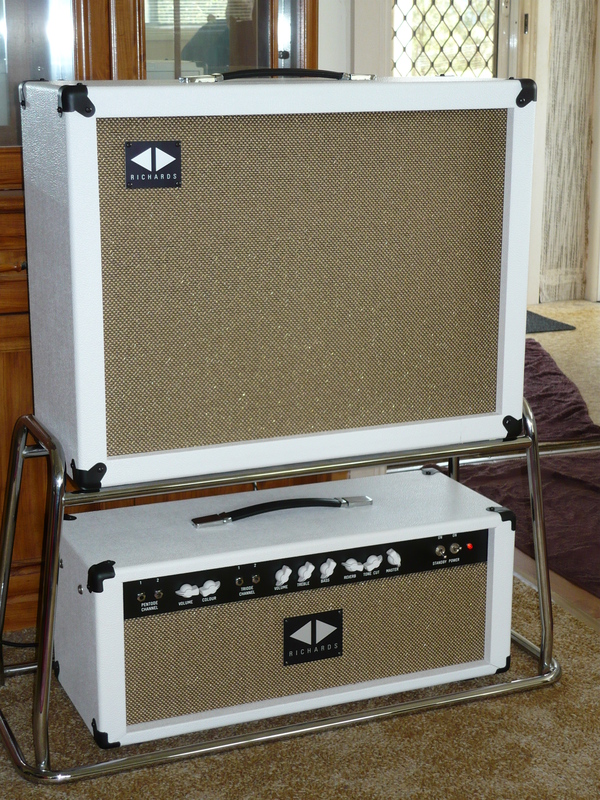 The dimensions of this cab were optimised to suit the chrome-plated speaker stands made for members of The Shadows club in Sydney. These stands replicate the look of the stands used by groups such as The Shadows & The Beatles with their Vox amplifiers back in the 60’s. 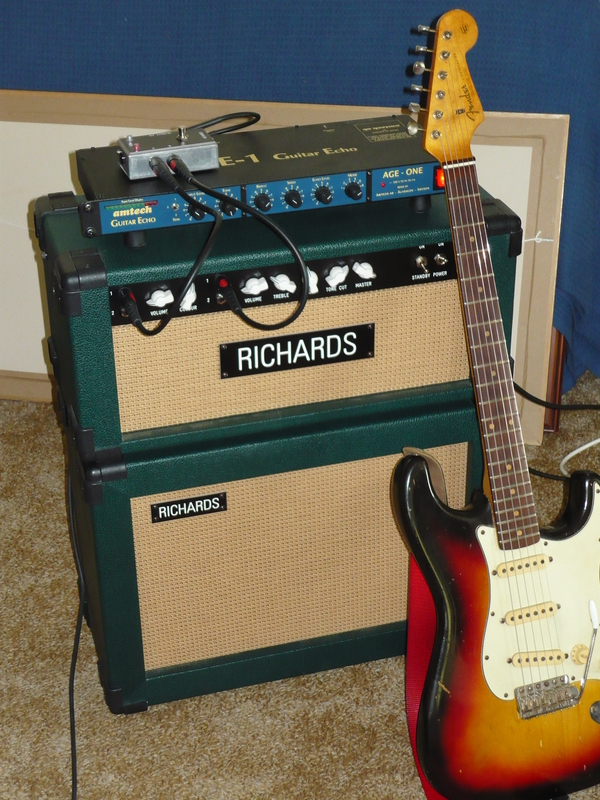 Barry currently owns two Richards amplifiers: a 30 watt Expressionist (4 x EL84) head with EF86 and 12AX7 channels, plus the custom addition of reverb, as well as a custom-design variation on the Blue Mood series amps loaded with a quartet of 6L6GC output valves for a very conservative 60 watts output. This latter amp was specifically design for Barry’s rhythm guitar playing style to facilitate huge chord sounds with lots of clean headroom. 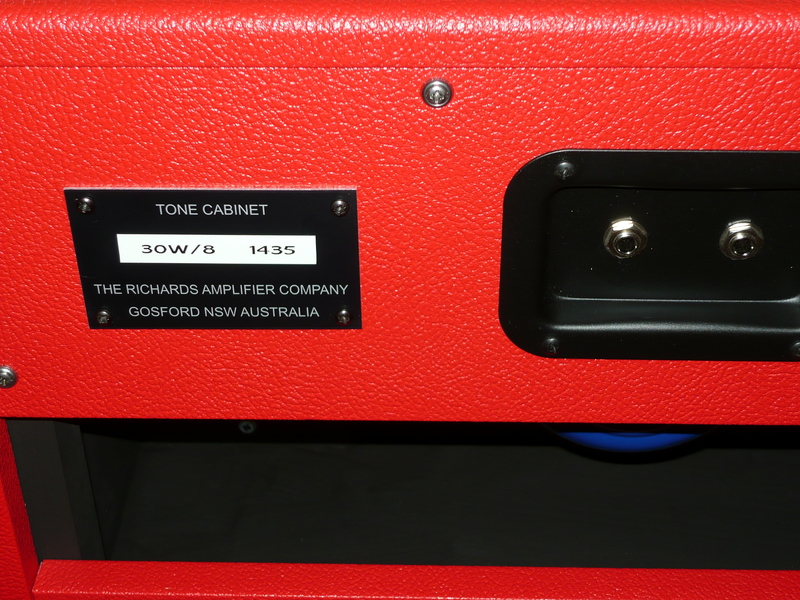 Every purchase of a Tone Cabinet from the Richards Amplifier Company Australia includes a complementary speaker lead. Heavy-duty lined covers are available as an optional upgrade. Cabinets are available in 1×10, 2×10, 1×12, 2×12 and 1×15 semi-open-back format, constructed either from furniture-grade ply with a choice of tolex coverings or exotic Australian natural timbers as an optional upgrade. Barry is a founding member of The Rebel Rousers, a 50’s/60’s rock’n’roll band, and has recently acquired celebrity status by appearing in the pages of The Australian Women’s Weekly Magazine, see page 257 of the September 2011 issue. Barry has become famous not for his guitar playing, but for his dahlias, a variety of flower as supplied to Saskia Havekes, a prominent Sydney florist. This blog continues directly from the previous post where we discussed the Rich Switch (Active) A/B/Y pedal. 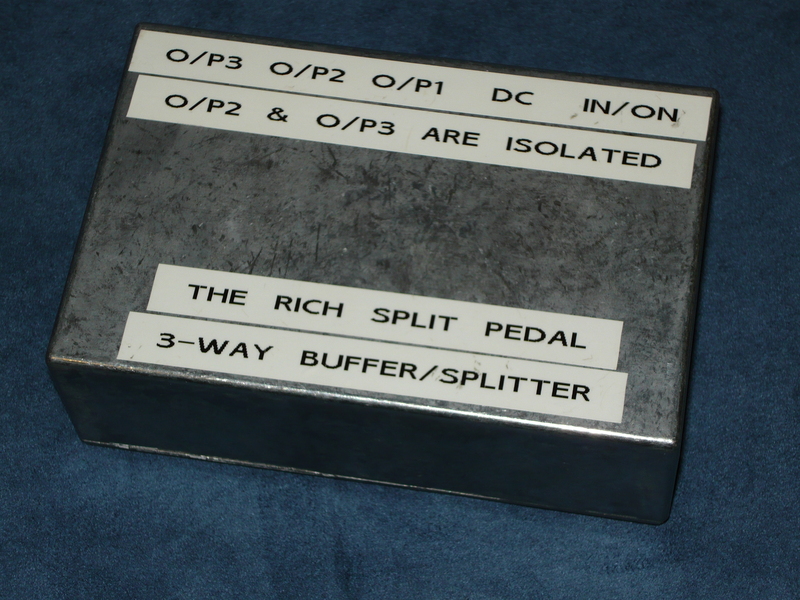 The Rich Split is another of our functional, problem-solving pedals, which are intended to be as transparent as possible, rather than creating a specific sound. Not very glamorous or exciting, but in fact very important to the modern musician. This pedal doesn’t even have a fancy label (yet), but instead relies on good old Dymo tape lettering. 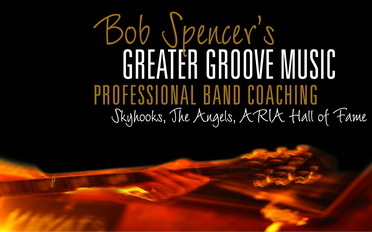 Bob Spencer is one of my long-time customers, and a loyal and trusted friend. Actually, quite a few of my customers end up becoming friends of mine, which is something I treasure. Bob probably bought the very first Rich Split, which actually had a fancy label, but it’s been redesigned since then. 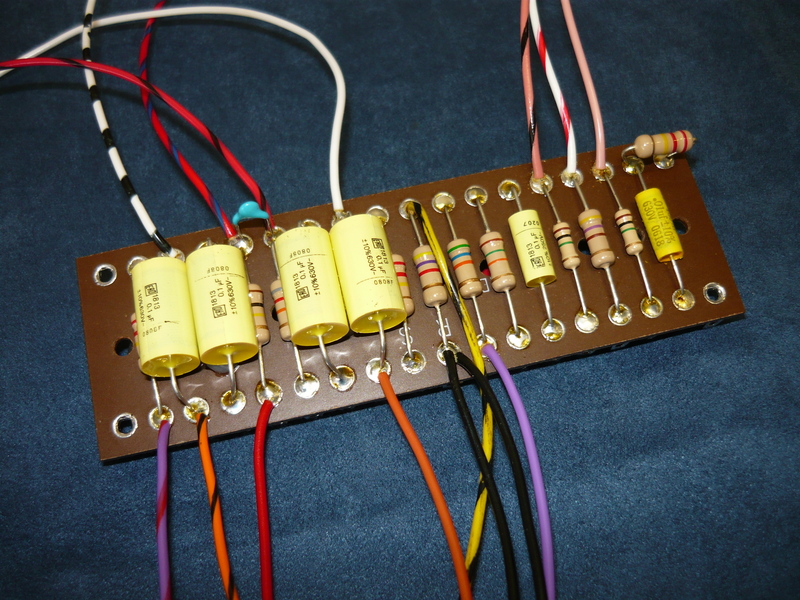 The Rich Split is custom-built to each order, but generally is built with 2, 3 or 5 splits and with 1 or 2 line transformers. The Harbuch broadcast/studio quality line transformer is quite bulky, and this dictates the size and weight of the pedal. 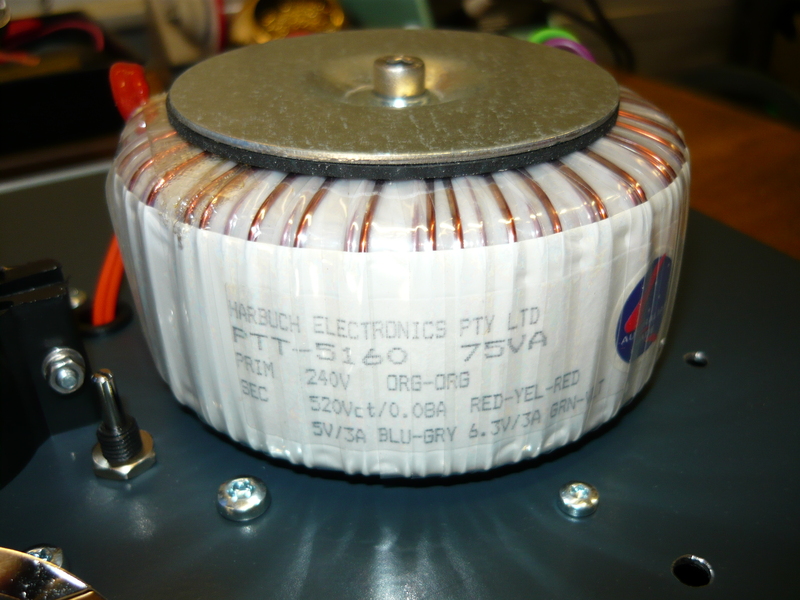 However, the superior performance of this transformer justifies the extra size, weight and cost. See the previous post photos for a look at this transformer. Originally the Rich Split and Rich Switch pedals were optimised for +9V DC operation, but now regulated power supplies of alternative voltages are commonly available. From June 2011, both pedals are shipped optimised for operation from a +18V DC regulated power supply (which we can supply you at cost). This provides greater headroom for the professional user. All pedals are still shipped loaded with a fresh 9V battery, for immediate use. All pedals are play-tested and functionality-tested by the builder before shipping. 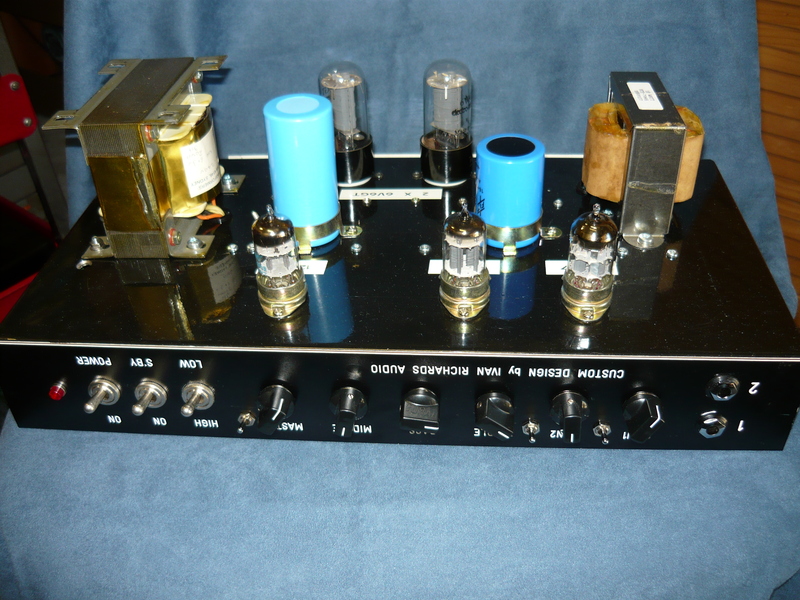 So, therefore, Bob has sent his 3-way (with 2 x transformers) splitter back for the +18V DC mod and a power supply. 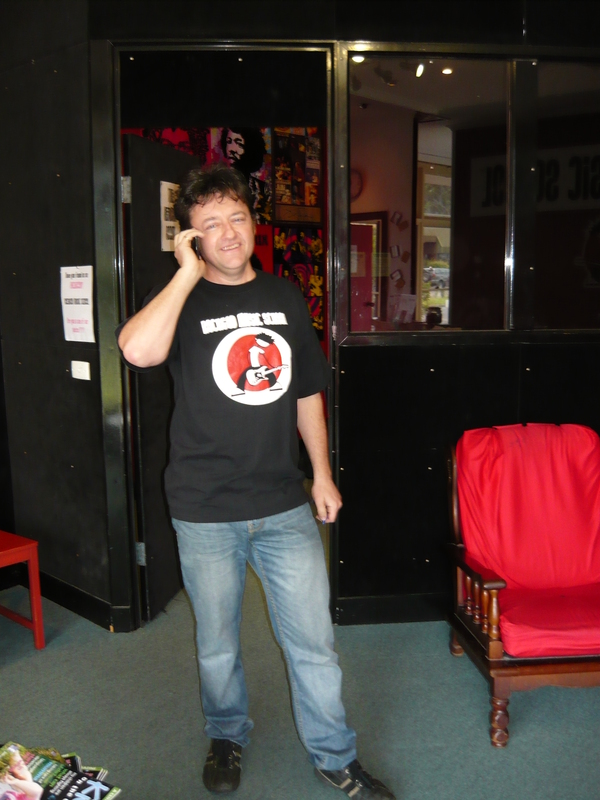 I believe Bob has been using the splitter to facilitate live recordings of gigs of the Melbourne-based band (with singer Mick Pealing) – Raw Brit. 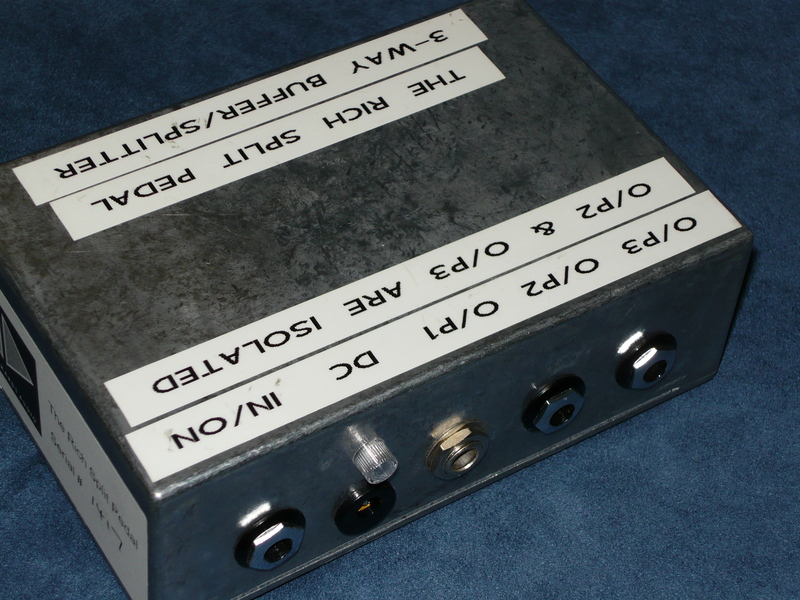 Well – here is the product description of the 3-way splitter shown in the photos. The Rich Split pedal is a 1-in/3-out active, buffered splitter, featuring a high input impedance and a low output impedance, which allows you to split your guitar signal, and run long cables, without sonic degradation ! The intention of this pedal is to facilitate the trend among guitarists to record and/or perform live with multiple amplifiers and/or effects chains – without impedance loading, ie sonic degradation – and resolve the problem of earth (ground) loops safely and professionally by incorporating broadcast/studio quality line transformers on outputs #2 and #3. The Rich Split runs dead quiet and features low-current-draw circuitry with individual buffers for each of the 3 outputs. The non-signal-inverting design ensures against phase problems. Therefore, all signals routed to your chosen destination (amps, pedals, FX processors, recording desk, etc) will be perfectly in-phase, and when combined will not result in a ‘smaller’ out-of-phase sound. 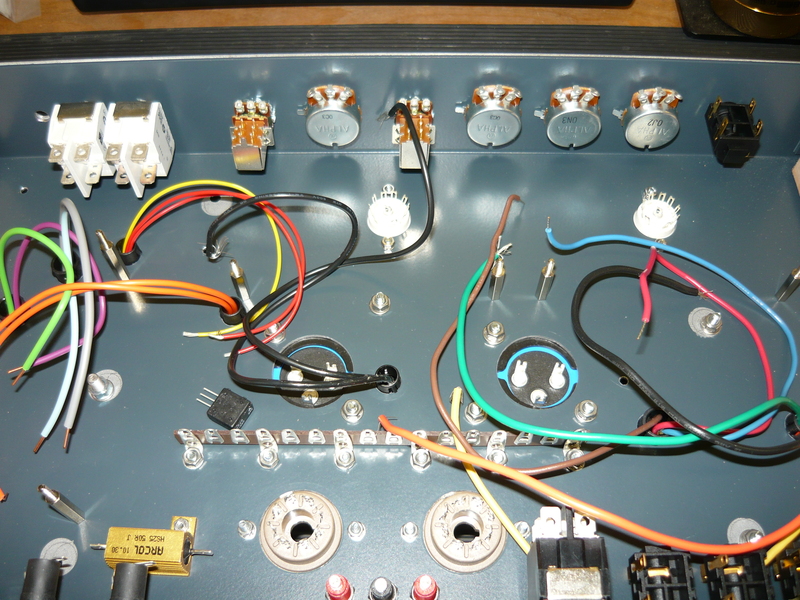 The pedal can be powered from either the internal 9V battery or via the external +18V DC adapter jack. For recording purposes, obviously battery operation will achieve 100% hum-free operation, but at the expense of headroom. The transformer-isolated outputs #2 and #3 make it possible to use two or three amps simultaneously, without having to lift the earth (ground) on any of the amps. 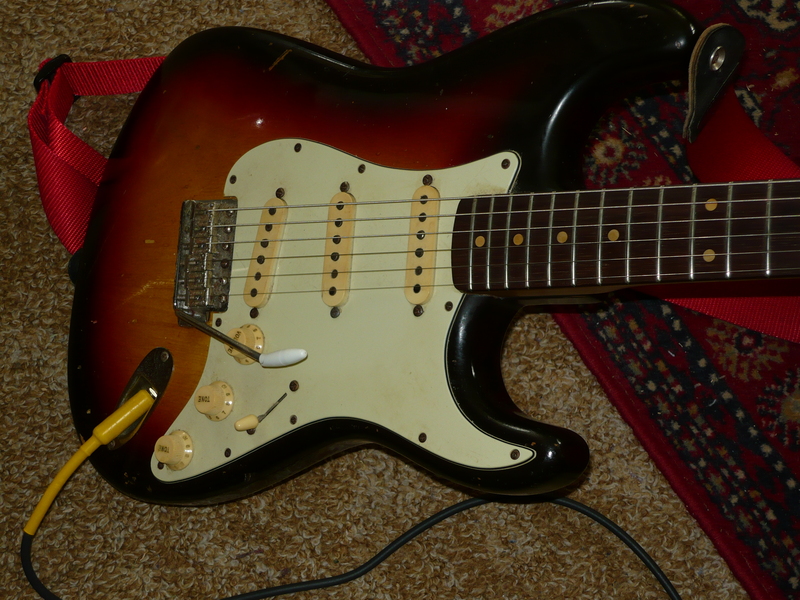 This potentially lethal ‘earth-lifting’ was the usual solution (in the bad old days) for eliminating hum introduced by earth (ground) loops when connecting two or three amps in parallel – definitely NOT recommended, plus its illegal. With the isolation provided by outputs #2 and #3, all earth (ground) loop problems are eliminated. Thank you, Bob, for providing us with the subject for the 2nd of this week’s blogs. In another blog to follow, we might consider some of the issues that arise when hooking up multiple amps.